DForD LuaCoding is a professional development environment for debugging Lua script in your applications. It's familiar and fast and you'll wonder how you ever worked without it. DForD LuaCoding is a full graphical IDE. 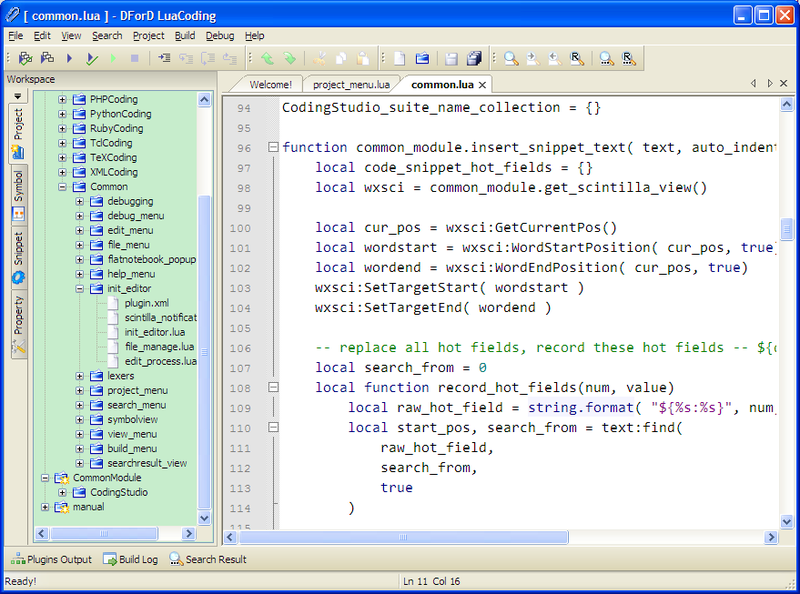 It supports syntax highlighting, symbol browsing/searching, auto-completion, code snippet, debugging, building and more. If you know MSVC, you'll be comfortable immediately (F5 to start debugging, F9 for breakpoints, etc). DForD LuaCoding is a professional development environment for Lua script. ...... 1. It supports the latest and greatest games and will work with your creation too. LuaCoding supports Lua programming language syntax highlighting. Users may customize font facename, font size, color and other formats of syntax elements. Syntax highlighting settings may be stored as theme, so that users may share their favorite settings with others. LuaCoding provides powerful project management features. All project management features can be accessed from the main menu or the context menu in Project dockable view. LuaCoding can open and manage only one solution at one time. One solution may contain one or more projects. One porject may have one or more folders, and one folder may include one or more files. Qweas is providing links to DForD LuaCoding 2010.10 as a courtesy, and makes no representations regarding DForD LuaCoding or any other applications or any information related thereto. Any questions, complaints or claims regarding this application DForD LuaCoding 2010.10 must be directed to the appropriate software vendor. You may click the publisher link of DForD LuaCoding on the top of this page to get more details about the vendor.